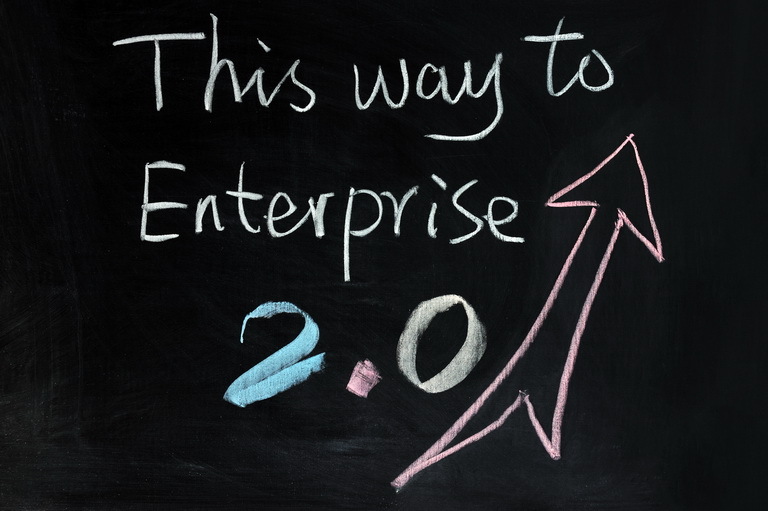 What is Enterprise 2.0 and why should I care? The simple answer would be that Enterprise 2.0 is a way to bring Web 2.0 into the office, but this is not entirely accurate. It’s true that Enterprise 2.0 is a push toward integrating the social and collaborative tools of Web 2.0 into the office environment, but Enterprise 2.0 also means a fundamental change in how businesses operate. What are these changes? Take communication for example. In a traditional corporate environment, information flows through an ordered path from station to station until it reaches its final destination. Enterprise 2.0 cuts the chains and instead of an ordered path, creates a ‘controlled chaos’. Don’t be afraid though, in this case chaos isn’t a bad thing, it only means that the information doesn’t have to go slowly from station to station, it will be reachable for everyone from the first moment, so communication, productivity and the pace of the work will become much better than it was in the traditional corporate environment. What are the main benefits of Enterprise 2.0? Social networking provides a great interface for Enterprise 2.0. As the efforts to implement Enterprise 2.0 into a corporate intranet grow, traditional interfaces for operating the intranet can become unwieldy. Social networking is uniquely qualified for not just providing an interface for the intranet, but also adding utility. After all, a business is run through a series of networks. A person might be in a department, but have a sub-department that they work closely with, and might belong to multiple committees within the organization. Social networking can help with the communication flow of these multiple networks. For larger companies, social networking can also provide a great way to find specialized skills and knowledge. Through profiles, a person can detail the projects they have worked on and the various skills and knowledge they have. These profiles can then be used by others to search and find the perfect person for helping out with a particular task. For example, if an executive is having a meeting with an international company and would like to have an employee on hand that speaks a specific language, a quick search of the company’s social network can create a list of candidates. Enterprise 2.0 makes everything easier and real-time, like communicating, creating and giving tasks, uploading and sharing documents, creating efficiency reports, etc. Use a quality enterprise social platform and make your employees’ work easier, quicker and more productive!